Click on the Lennox Premier Dealer below to leave a review for us on our site. I appreciate the quick, expert service we received from Nebo Comfort Systems. They came to fix our furnace right away and didn’t over charge me when it turned out to be a small part that needed to be replaced. I liked their service so much that when we decided to add air conditioning to our home, they were our first call. Again, they took care of us quickly, they helped us choose the best system for our home, and helped us with the rebates. So bring on summer, thanks to Nebo Comfort Systems we’re ready for it! We have been using Nebo Comfort Systems for a couple years now for our HVAC needs. They are great to work with and very prompt at responding to our calls. During one of their visits we noticed our hot water heater leaking. They said they install water heaters and gave us a very reasonable bid. They put in a tankless water heater with instant hot water at the faucet. We used to have to wait a really long time for the hot water to get to the faucet. Now water is available within a couple of seconds. We have had many complements on how nice it is to have instant hot water. Thank you Nebo Comfort Systems for the great work. Robert Moore and Nebo Comfort Systems keep me comfortable year round. I love that I can trust them and they will always take good care of my family. If you need your air conditioner or heating system repaired or replaced, don’t go to just anyone, go to Nebo Comfort Systems and get the best! These guys are the best. Robert knows what he is doing when it comes to helping us with all of our HVAC needs. He is clean cut, and honest, and an all-around great guy. I feel 100% safe with him in my home. The office staff are polite and helpful, and always do what they can to keep me, as a customer, informed. I would definitely use them again. Nebo Comfort really saved the day when our furnace wouldn’t come on this winter. They came right away and had the problem fixed quickly. They showed us how to change our filters so we don’t have the same problem again. We REALLY appreciated the great service we received. We *LOVE* Nebo Comfort Systems! We woke up yesterday to a furnace not working. Messed around with it ourselves for 24 hours, then decided to call Robert first thing Monday morning. He was at our door within 15 minutes of our phone call! He had the problem solved in a jiffy with no need of purchasing anything or a lengthy service call. Heater is running and we are warm and toasty. We were thrilled with the speed of service and great price! Thank you Lonny Ward. 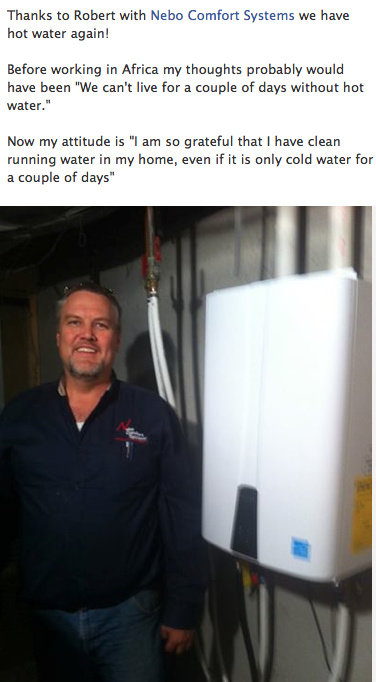 He was so happy with his new tankless on demand water heater he put us on his Facebook page. Nothing makes us feel better than knowing our customers trust us enough to recommend us to their family and friends.